Don’t you just love words that rhyme? 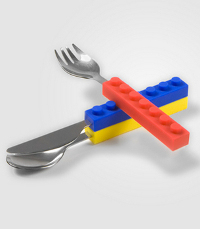 That’s what the Snack & Stack utensil set is all about, where $22 will definitely make your child’s dining experience a whole lot more fun and saving you plenty of frustration in the process. Sounds pretty much like a good investment, no? At point of publishing, there are only three of these puppies left available, so you might want to hurry up and make a beeline for your purchase. After all, opportunities to liven up your meal times come once in a while, and you wouldn’t want to wait for another 100 years, do you? (we jest here). The Snack & Stack utensil set can be easily stacked up for easy transportation, especially for folks who buy their lunch and bring it back to the office, requiring some utensils of their own since they are paranoid about using those from the office pantry. It is also small enough to fit into lunch boxes, picnic baskets, desk drawers or glove compartments.